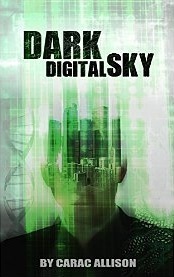 Dark Digital Sky is a novel about a Private Investigator, initially hired to find a Hollywood powerbroker's progeny - three men who grew from his donor sperm. While his investigation swings into gear, America finds itself subjected to a series of crimes - heists and theatrics seemingly motivated by some kind of political agenda - and our detective tracks not just his own case, but keeps aware of the news. There are many things to like about this novel, but also some which are a bit frustrating. Let's start with the frustrations: the plot takes quite a while before there's real tension. For a good third of the novel, our PI basically stalks and manipulates three men and people connected to them, without anything other than an easy paycheck driving his ambitions. The plot does pick up, and eventually there are stakes - higher and higher stakes - but at the start, things aren't as mysterious and intriguing as you'd expect from a thriller. With regards to our detective's work, there is a split between the technical and the human stuff: he's utterly convincing when using technology, hacks, botnets, and other digital methods to track down, investigate, spy upon, disrupt or manipulate. But when it comes to the human interactions, the story seems to be outside its comfort zone. Our hero's method is basically: find source. Ask source questions. Get all the answers. It's true that his angle of attack varies - slightly - between the people he approaches, but every single one of them ultimately answers all his questions with all the information in a single interview. A reader willing to suspend their disbelief would argue that this is the reason why our detective is so successful, why he can afford a Porsche and being quite particular about his methods and very direct when interacting with his clients. Personally, I wasn't convinced - our hero is way too blunt with almost every character, and I simply did not believe that no one disengages from his confrontational approach, when flustered. If someone met me under false pretences and revealed their lie, I'd walk away. None of the characters in this novel do. It felt too much as if each human character was treated as an information repository, which, queried by our detective, spills out all its data, exactly as laptops and hard drives spill their secrets once cracked. The writing is to the point. Our hero is somewhat cynical, like a detective should be. He does have a tendency to opine about things that one does not expect a detective to be waxing lyrical about: he wears a different black rock band t-shirt each day and briefly describes each motif at the start of each day. He has read hundreds of books and watched many movies, and every evening he winds down simultaneously watching films, re-reading novels and keeping track of the news, in a multi-screen set up that could be straight from Back To The Future 2. Oh, and our hero is bipolar, with a keen interest in his medication (and a habit of describing it, and his brain, with the sort of attitude that wouldn't be out of place in a car enthusiast, fine tuning the engine of his most precious, if somewhat temperamental, classic sports car). Having a bipolar detective as hero is not something I've encountered before. I guess after OCD detective Monk, in-care detective Girl with the Dragon Tattoo, a schizophrenic detective in Perception, a deaf detective in F.B.Eye, a paraplegic detective in The Bone Collector, and many, many arrogant geniuses with flaws where social niceties would be (cough, Sherlock, House, Lie To Me, cough), there isn't going to be any disability, physical or otherwise, that isn't going to have a detective series dedicated to it. That said, the manic episode is the most interesting and well-crafted part of the novel: it allows the detective to remain convincing while making decisions that would be out of character for a super-competent hero, so his condition certainly earns its narrative keep and does not feel like a gimmick. The novel moves quite quickly, and while it takes its time to build up tension, it never gets boring. It's entertaining and smooth to read, comparable to thrillers by Michael Crighton, Jeffrey Deaver, Robert Galbraith and especially Michael Marshall (with a sub plot that slightly echoes the Straw Men mythos being built up by Marshall). It's a satisfying popcorn read, technologically convincing, and very smart when it comes to the baddies' attacks & the wider repercussions of those deeds. It's not as satisfying when it comes to character interactions, and every now and again the plot construction feels a bit forced, but to be fair, neither Dan Brown nor Michael Crighton worry too much about these things. It's got a good pace and an interesting hero - it's certainly a promising start to a series. For comparison, I'm more likely to continue reading this series than I am to continue reading Jim Butcher's Dresden Files after trying the first two.